I love to sew. Until recently my sewing table was the kitchen table. I actually love the space that the kitchen table offers. The problem is that my stuff gets in the way when it's time for dinner. Back when we only had two kids, it wasn't a big deal. I would just shove all my stuff to the one end and we'd eat at the other end of our large table. But now we need all the room for eating. So I have to clean up my mess by dinner time, even if I'm not done. Enter this little table. I grabbed this up several years ago when a neighbor was getting rid of it. We've had it in our bedroom with an old computer on it that we never used. I decided that it was the perfect table for my sewing machine. It was white, and other than a few nail polish spills, there was nothing wrong with it. My new craft room/guest room/storage room is painted green and the shelves I've hung are cream. It was time for some color. I used Rustoleum Painter's Touch French Lilac in Satin. The next day I took some sand paper and distressed it. I love the white popping through. The drawer is perfect for holding all my extra thread and other sewing accessories. And it hides all the mismatched colored containers. I'm so in love with this color against the green walls. It's so pretty. What do you think? I know lilac is not really an "in" color. But in this room that is for the most part "mine" I wanted to use colors that I really like and not trendy "in" colors. Rachel, you did an amazing job on this! Great makeover! Lovin' the purple! The table is cute and that drawer so organized! Wildly Original linky party is open. What a great table. The makeover looks beautiful. I LOVE the look of this! 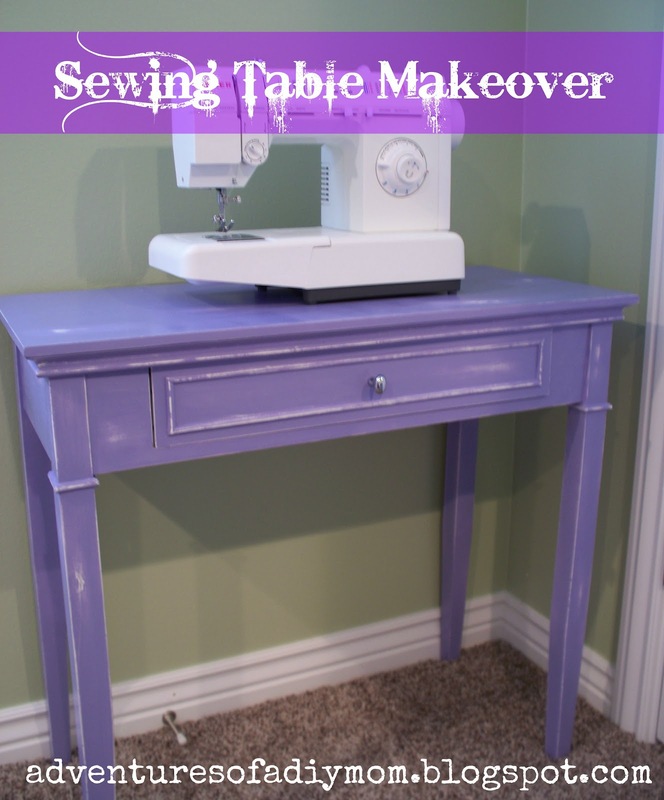 I'm actually getting a sewing table from my step mom and this is a great inspiration for me to re-purpose it! THANKS for sharing!! Great job and great color! I agree, you should use colors that appeal to you rather than what's trendy at the moment...saves you the trouble of redoing it when those colors are "out" later on! Thanks for sharing at Shine on Fridays! I'm in love with that color! It turned out so well and doesn't even look like the same table. Thank you so much for sharing at my Throwback Thursday party. I am excited to see what you share this week! love it love it love. not just this post but all blog!!!!!! i am new to bloggin but u definatley inspire me ! I love the color and this is so much nicer than the rolling file cabinet I keep my sewing machine on. Thanks for sharing on Tout It Tuesday. Hope to see you tomorrow! You did a great job....I love the pop of color.